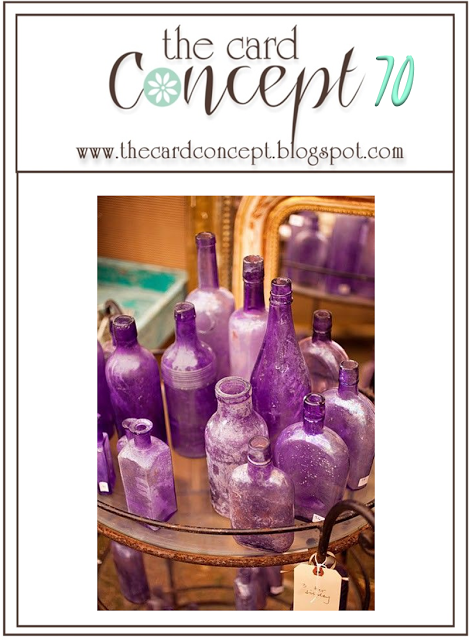 At The Card Concept this week, the theme is Purple Haze. The bottles are so inspiring for both shape and colour. I can't wait to see what you come up with. The glass bottles headed me off in the vellum direction. I just had to decide on the stamp set and the colour of the embossing powder. In the end, I chose the Verve Stamp set - Be Blessed for the flowers and the sentiment. In keeping with the warm background behind the bottles, I embossed the flowers with Hero Arts Gold Embossing Powder then coloured them with three Distress Inks. The leaves are a Clearly Besotted - Leafy Accents Die. 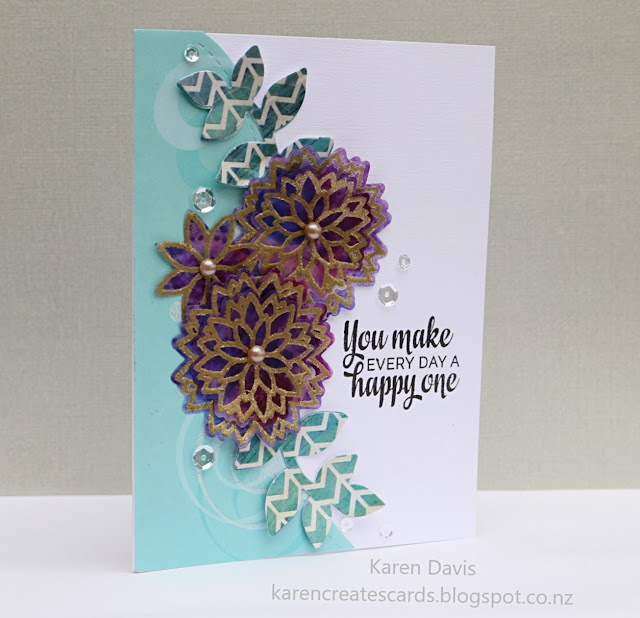 I used a bold, patterned paper to add a bit more interest to the simple, two-tone background. 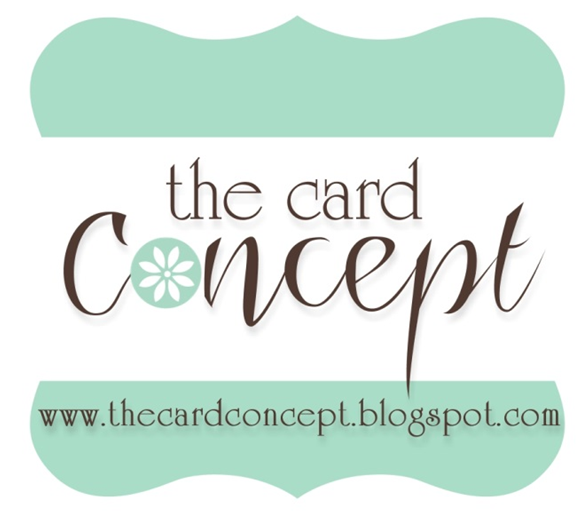 The curve on the aqua paper is cut with a die from Lil' Inker Border Builders. A few sequins and pearls finished the card. Karen, I LOVE your card! I was originally trying to create something like this with purple medallions but I just couldn't get it right! Your card is so pretty! I love the color combination too! This is GORGEOUS, Karen! Love the stained glass look you achieved with the flowers. Karen, this is gorgeous! I love where the inspiration photo took you. Beautiful take on the inspiration photo, Karen! The boldness and elegance of the flowers works so well with the "lightness" of the aqua panel. Gorgeous! Love the use of vellum! Gorgeous! I am loving how you used the vellum for those beautiful flowers!!!! How pretty! Love the vellum! I like being your new bloggy friend Karen..